Cut up to 1/2 inch off the stems and remove leaves that will end up in the water. Store flowers in a floral cooler or refrigerator between 36-50 F.
Removing a few leaves around the flower head will enhance the flower display. Use a commercial flower preservative for added longevity. Check water levels frequently, flowers get very thirsty. 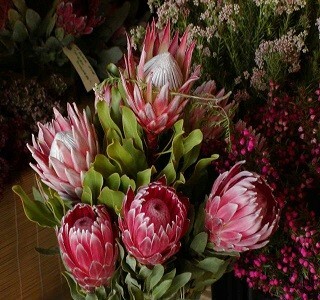 Protea dry well by hanging them upside down in a dark location or just let your arrangement dry naturally.